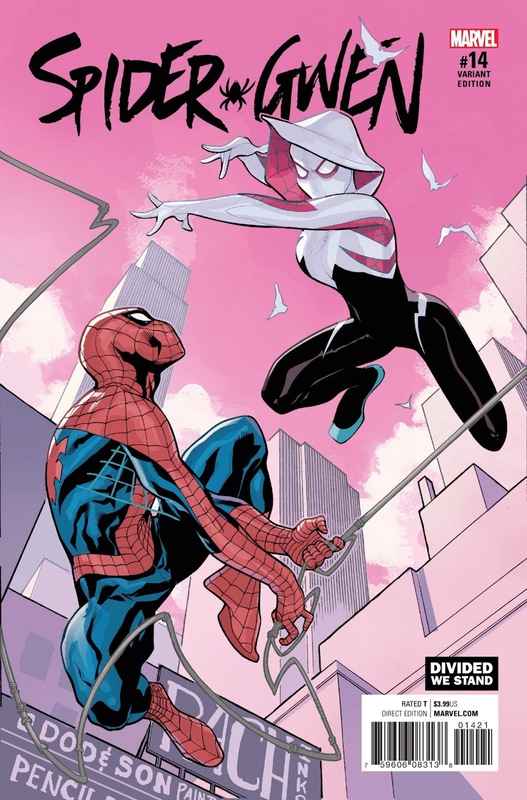 Our variant cover - out in stores now! 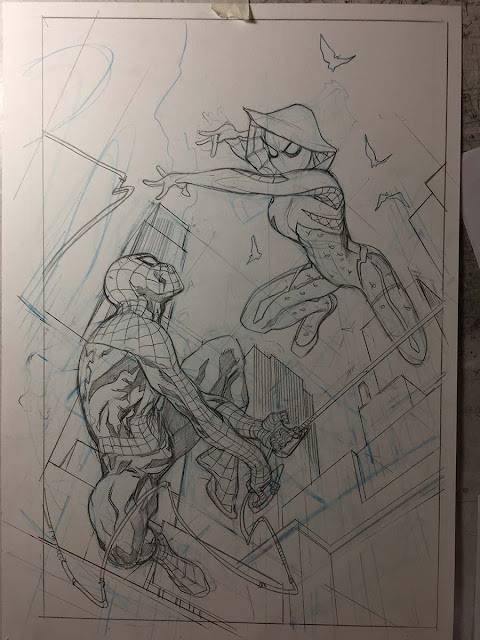 Here's a look at how we made it! 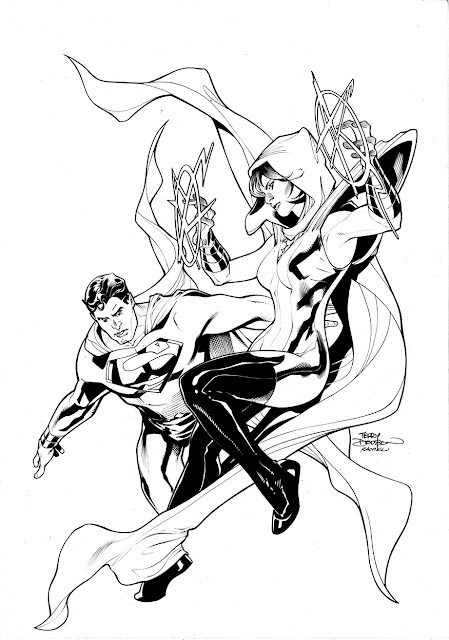 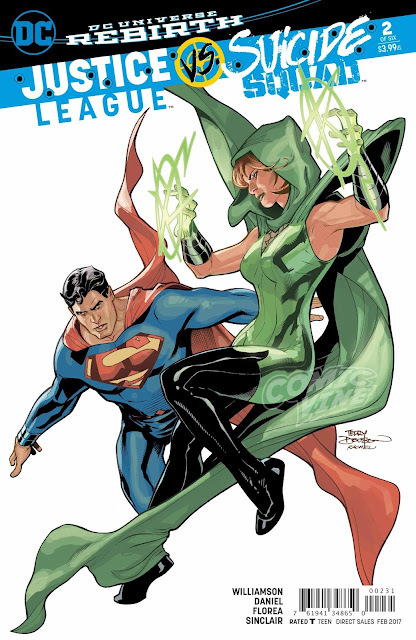 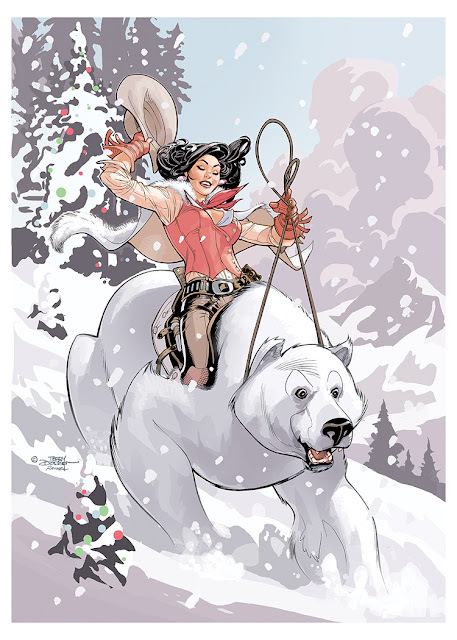 Rachel Dodson started with Superman's face first. I love how she treated his hair! 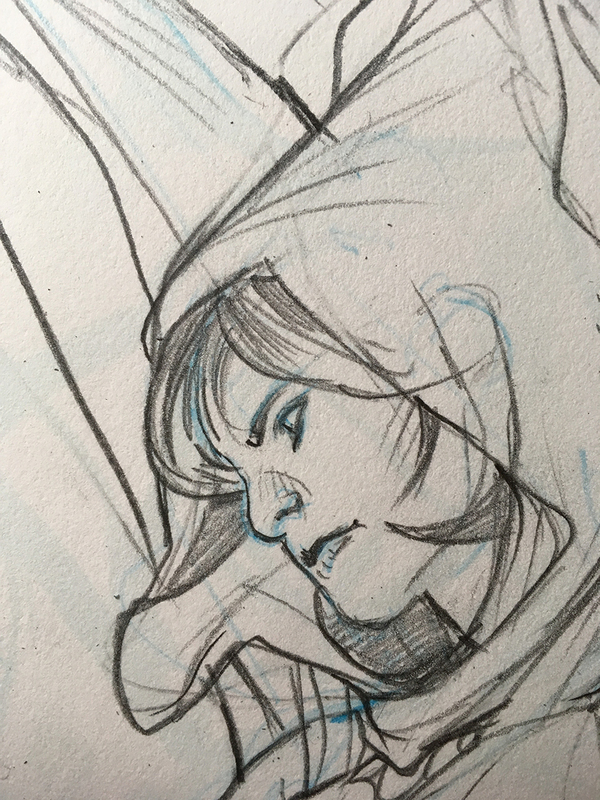 Next she moved on to Enchantress' face. 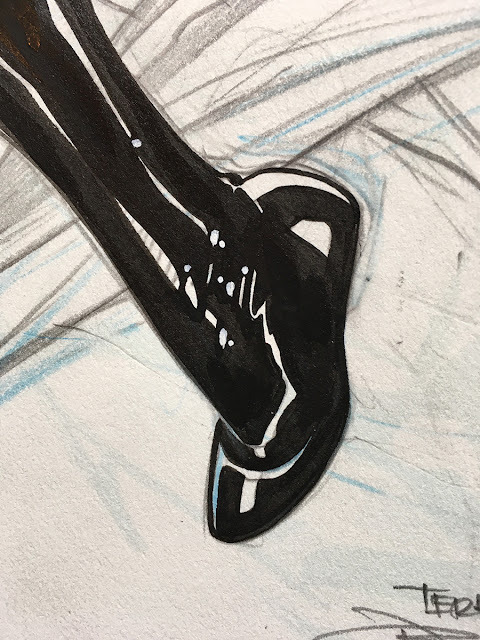 Rachel inks over my pencils with a Windsor Newton Series 7 Kolinsky Sable #2 Brush and Dr. Martens Hi Carb Ink to ink the covers with. 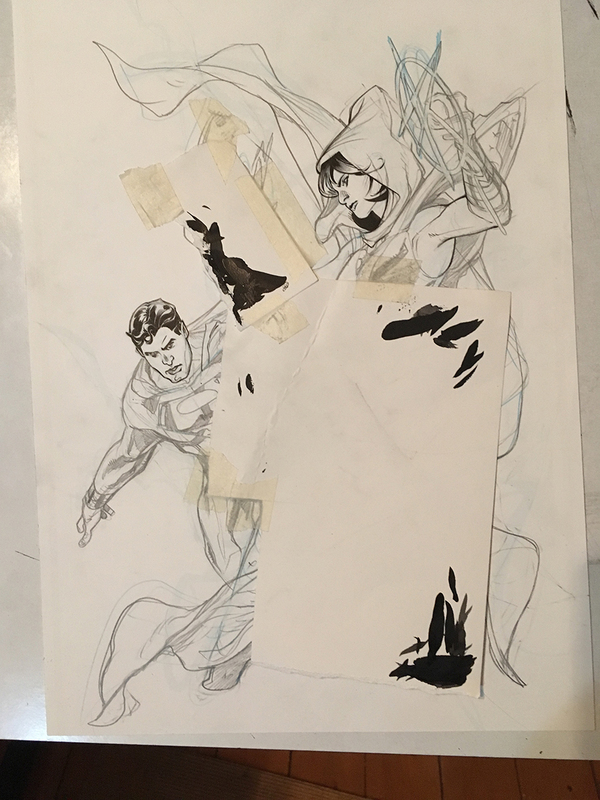 She then inked the mass of the main figures. 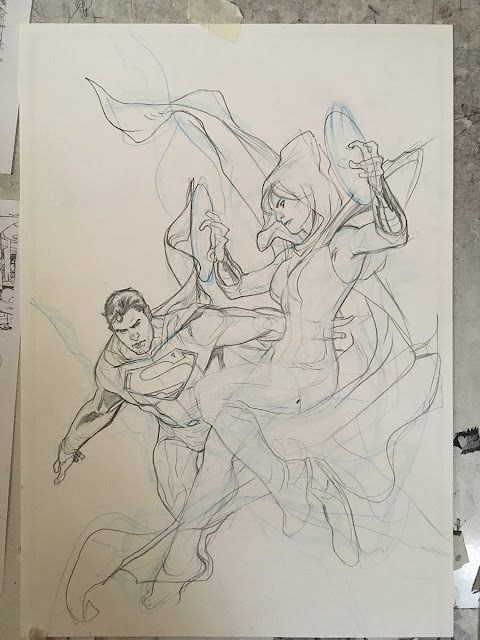 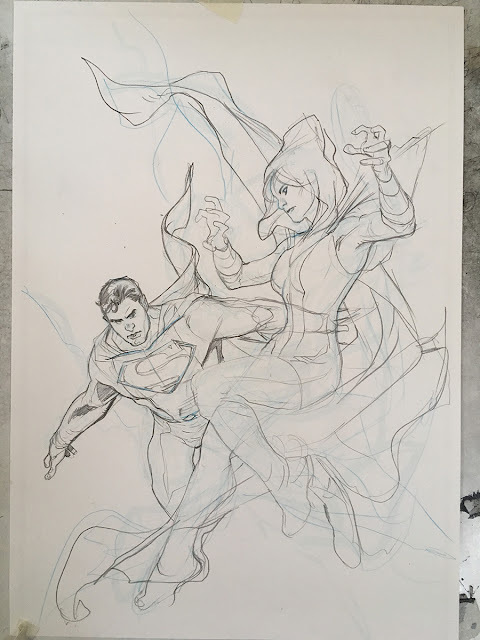 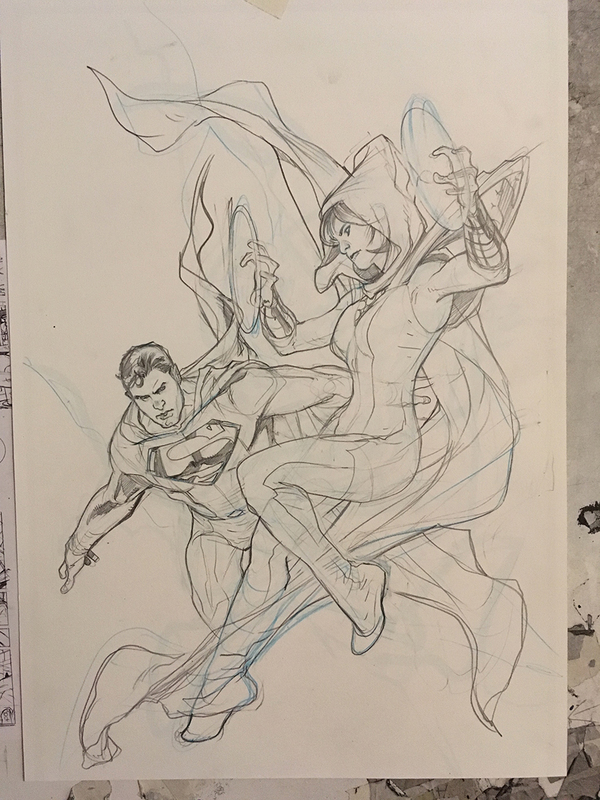 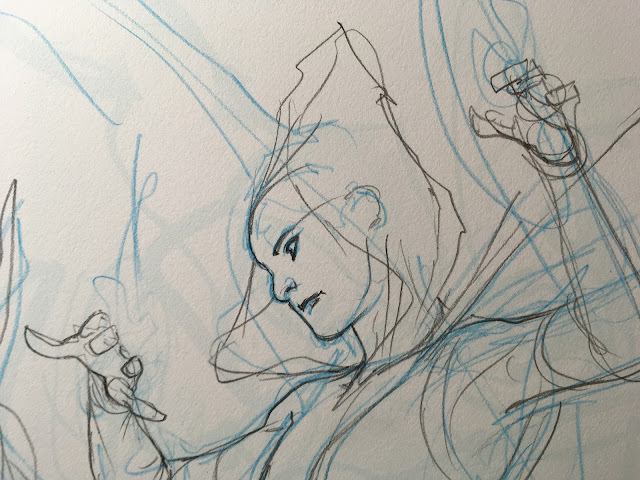 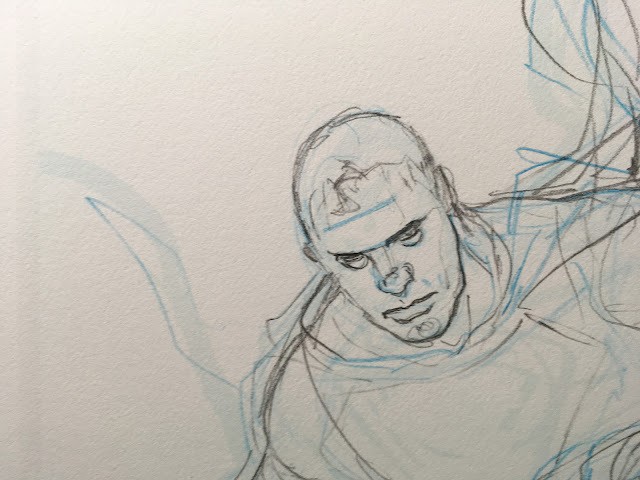 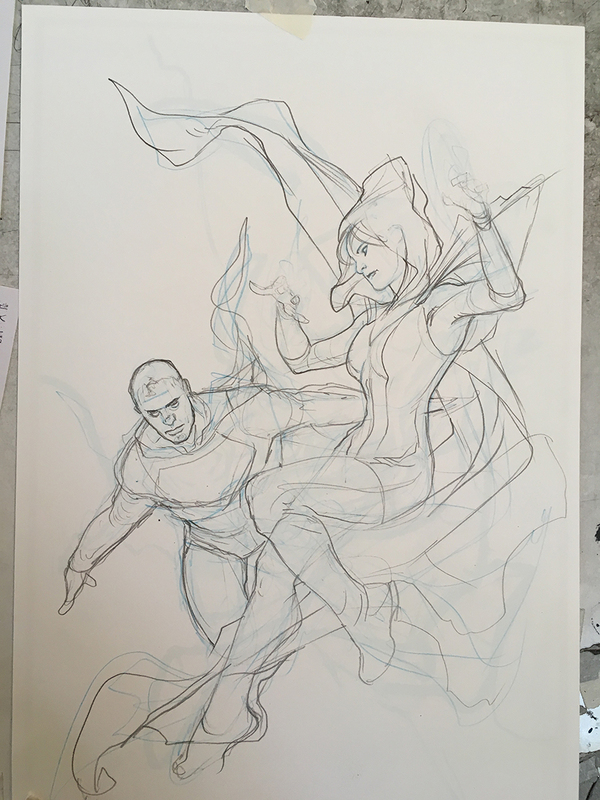 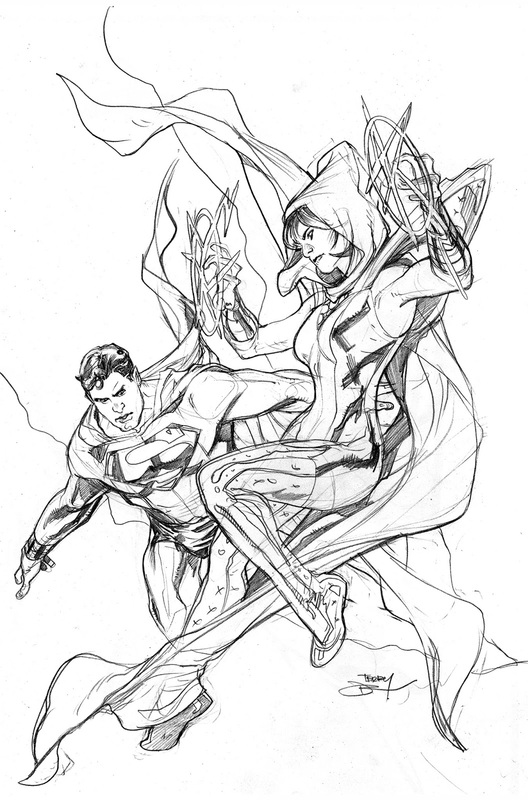 Here's video of Rachel inking the cape and Superman! 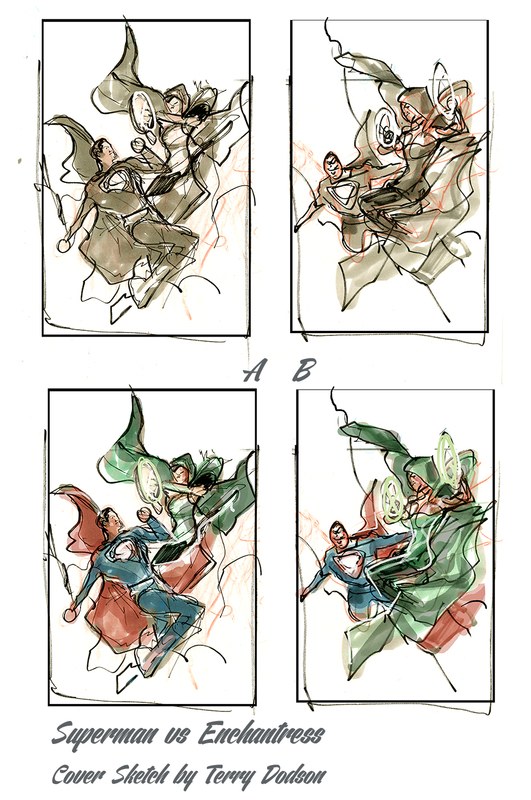 My initial sketches for the cover submitted to DC Comics. Quick rough in drawn in Light Blue and HB lead on 12" x 18" Bristol Board . 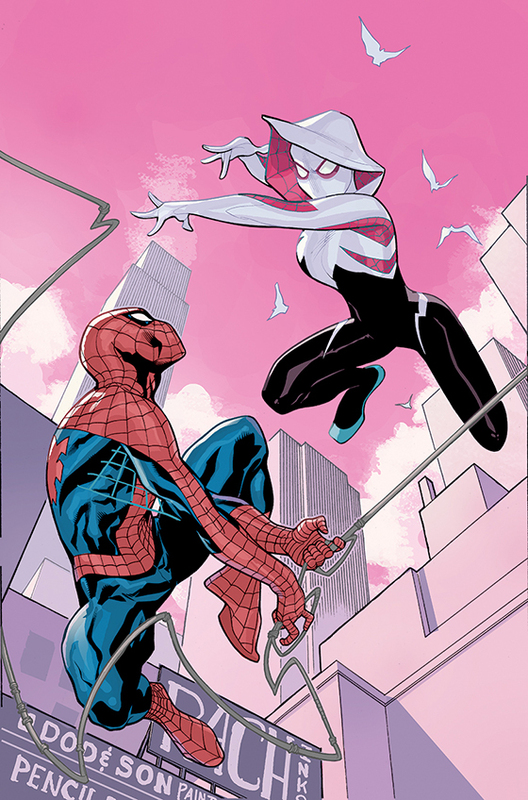 Rachel Dodson and I did the variant cover for Spider-Gwen #14. Out now from Marvel Comics! Here's the Part 3 of the Step by Step of how we made the cover art! 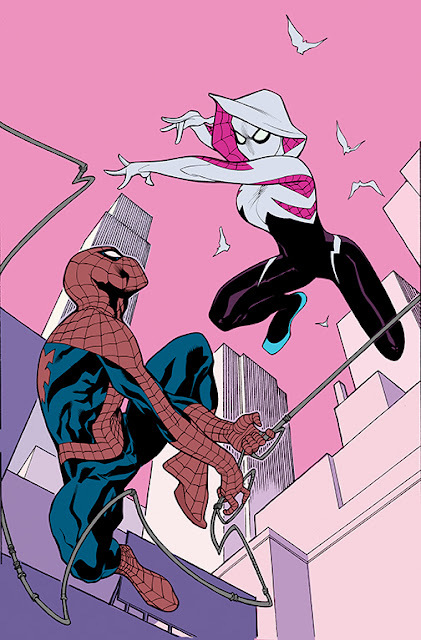 I colored this on my Cintiq 13 HD using Photoshop CS3 . 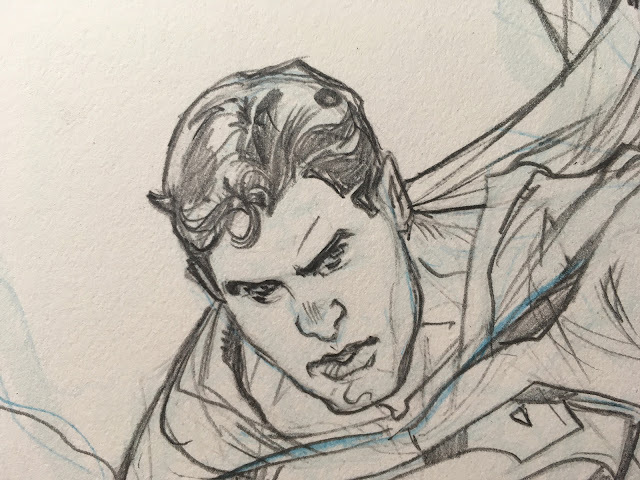 Using the Pencil Tool on the figure and a customized brush for texture on the clouds. I used the Gradient Tool for the Background. 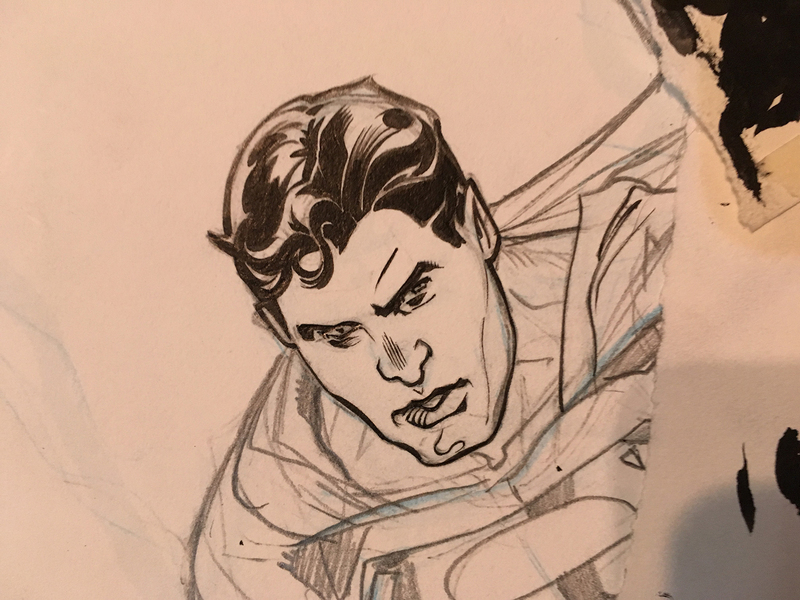 And I use a Custom Brush for the Clouds. 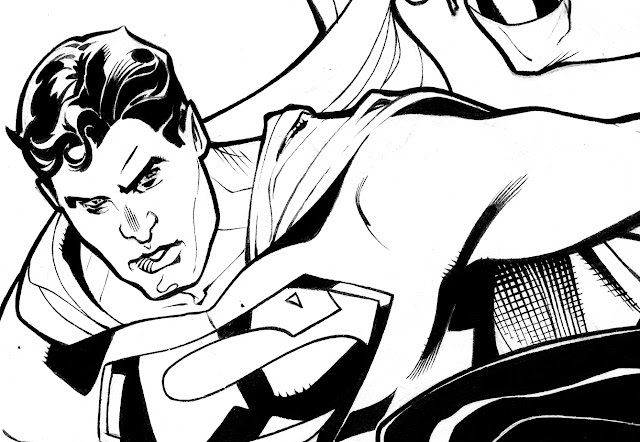 At this point I like to color the line art... especially the interior edges and the edges facing the strongest light. Of course, I lose as much of the line as possible - especially as I move away from the "camera". 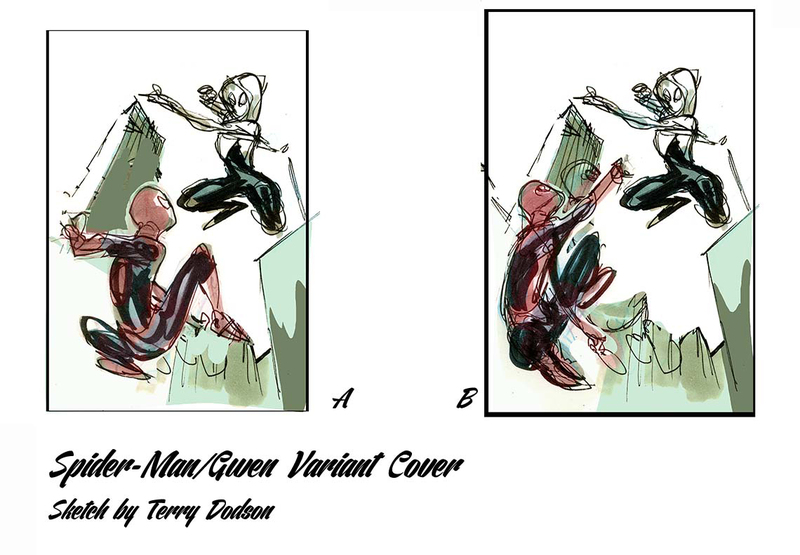 Here's the Part 2 of the Step by Step of how we made the cover art! Rachel likes to start inking with the main figures. 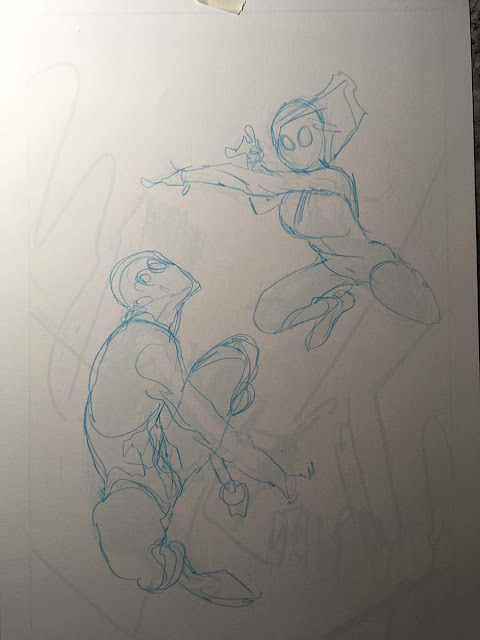 Figures down, time for backgrounds. Here's the scan of the final inks that I clean up in Photoshop to color. 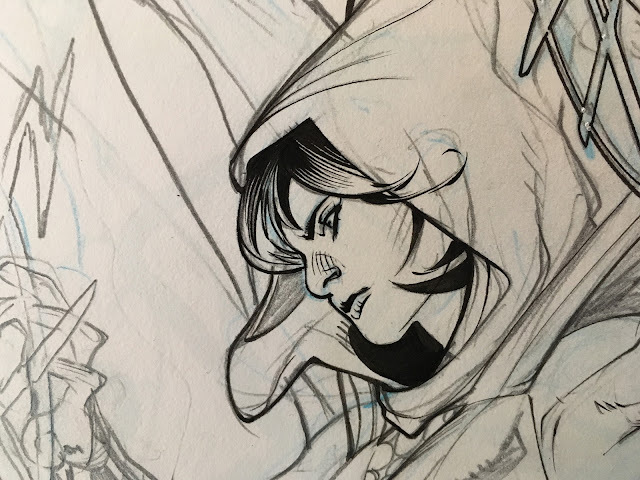 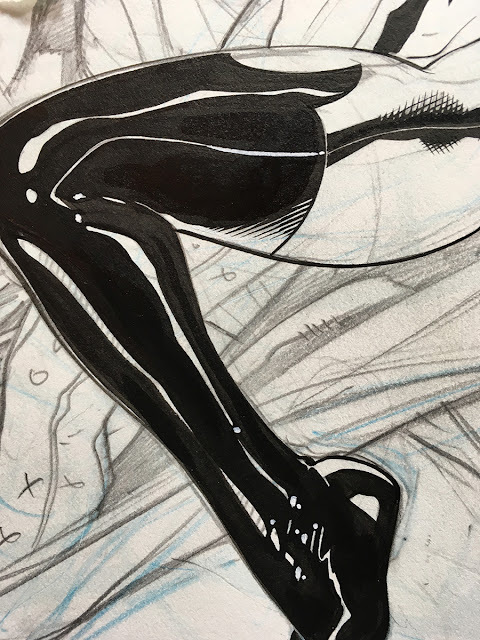 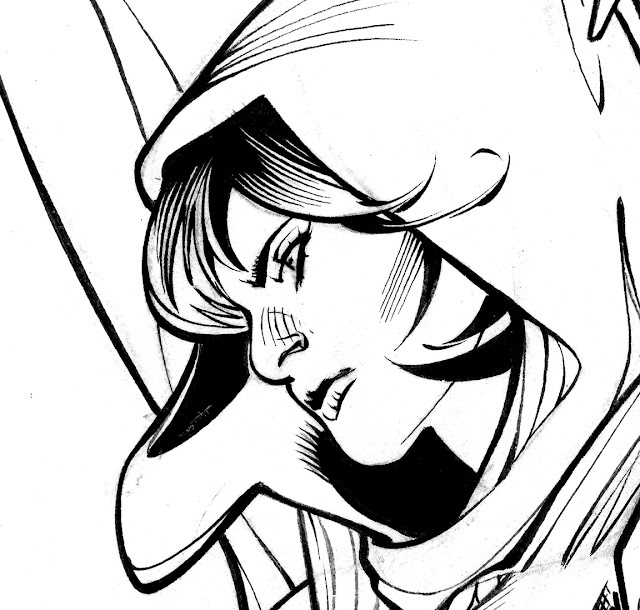 Detail of Rachel's final inks! Here's the Part 1 of the Step by Step of how we made the cover art! 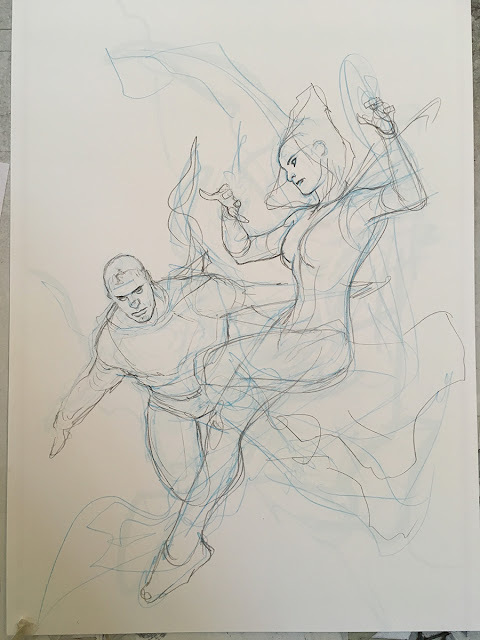 My initial sketches for the cover submitted to Marvel. 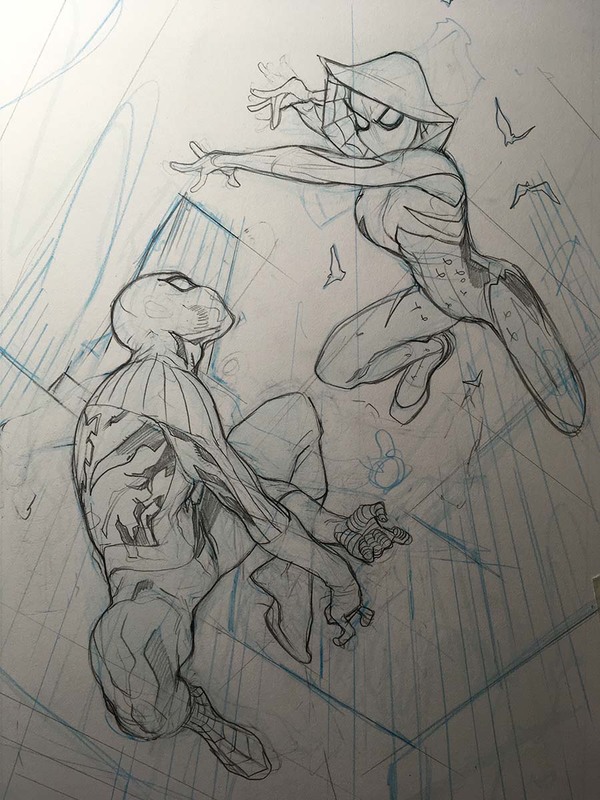 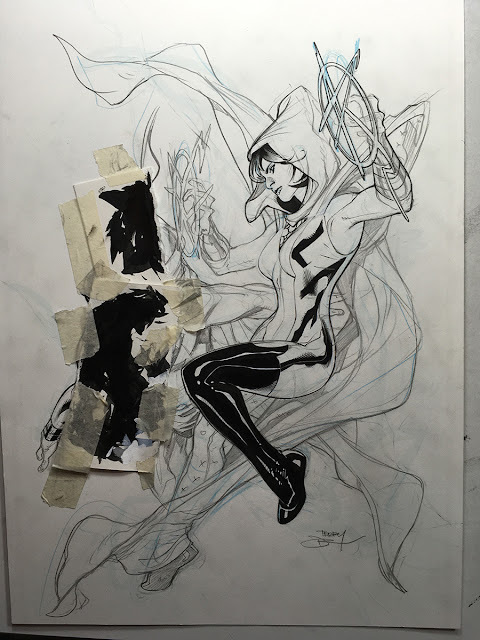 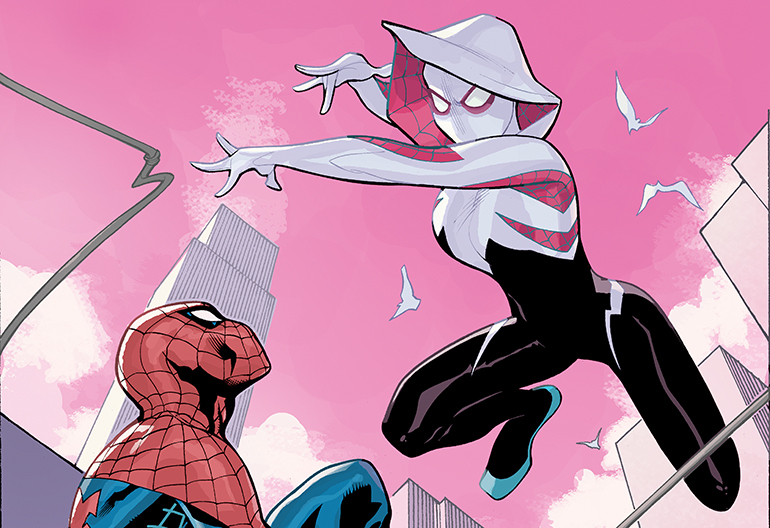 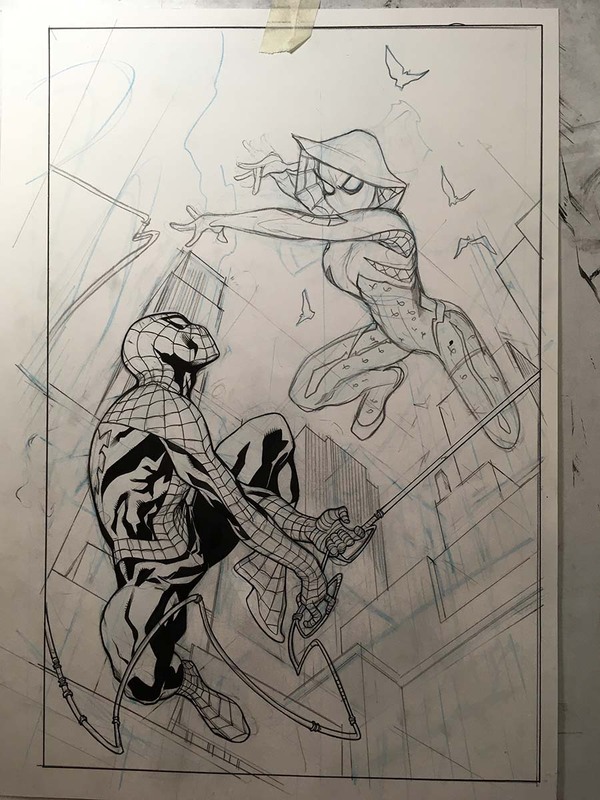 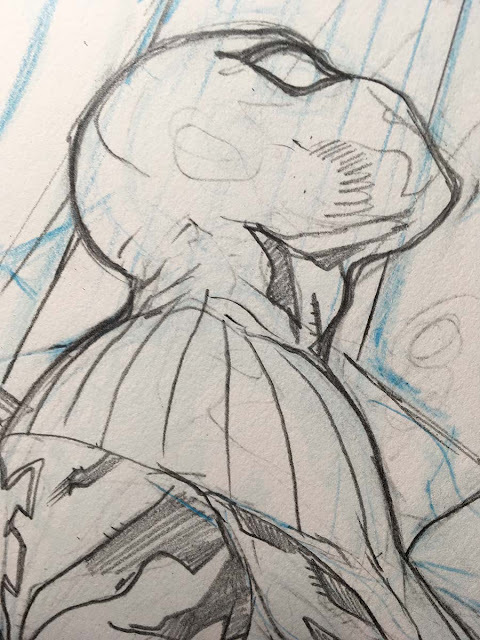 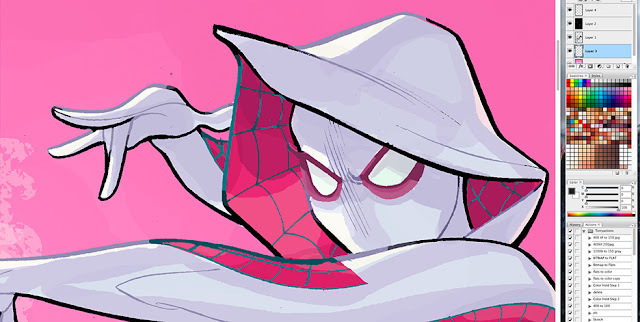 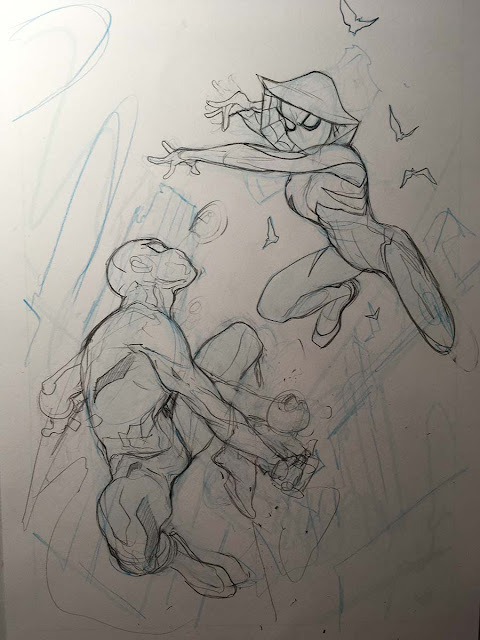 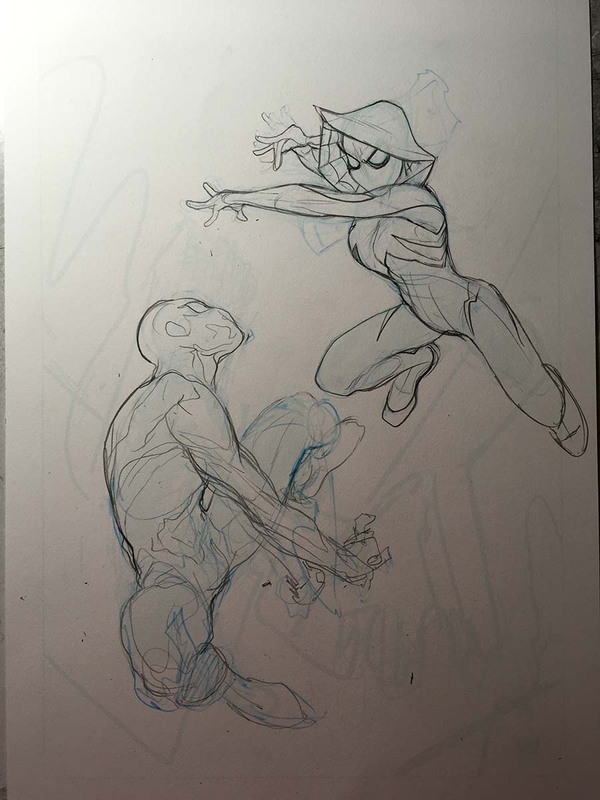 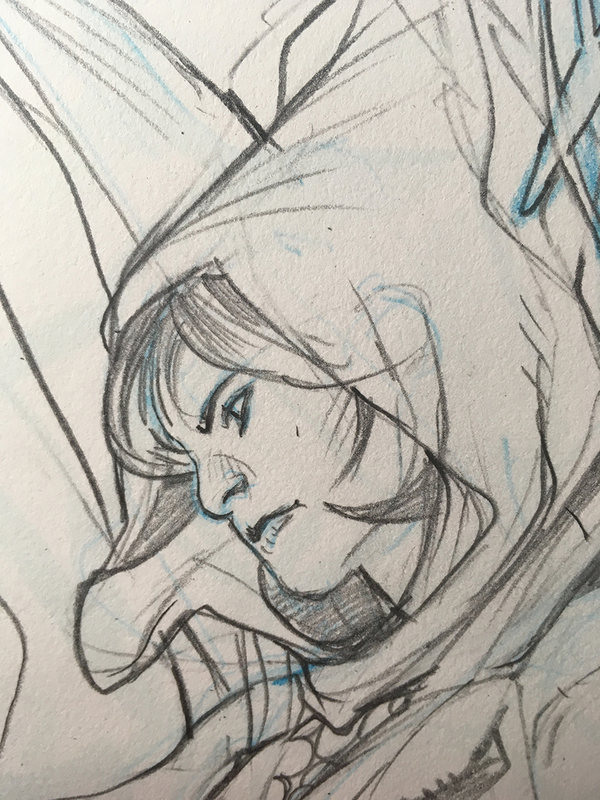 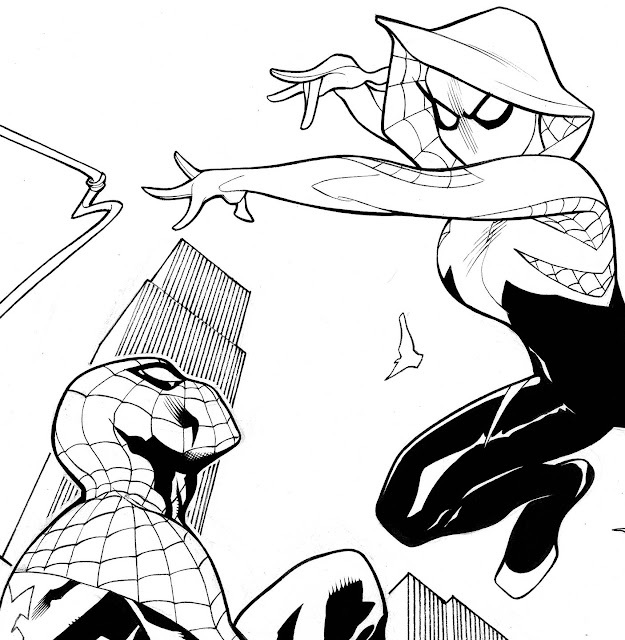 First time I've ever drawn Spider-Gwen professionally ... looked forward to this one! Just quickly drawn in with a Col Erase Light Blue Pencil. 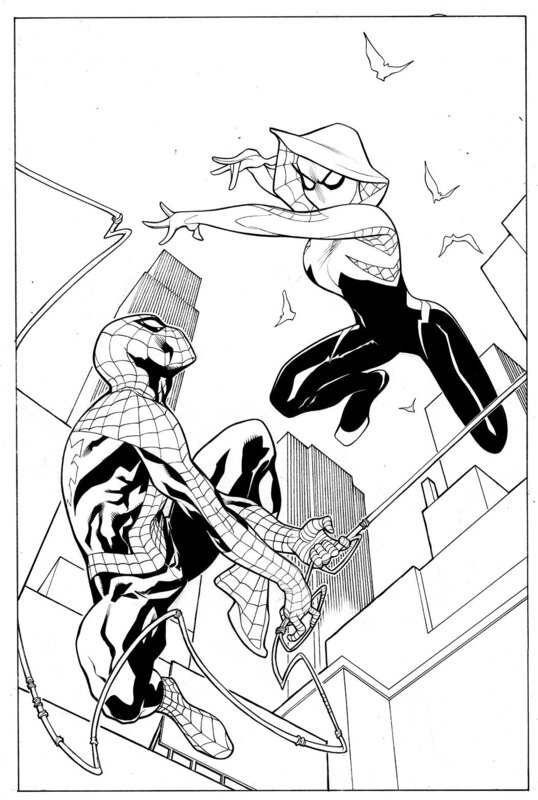 Drawn in and HB lead on 12" x 18" Bristol Board . Really happy with Gwen, so went right into finishes. 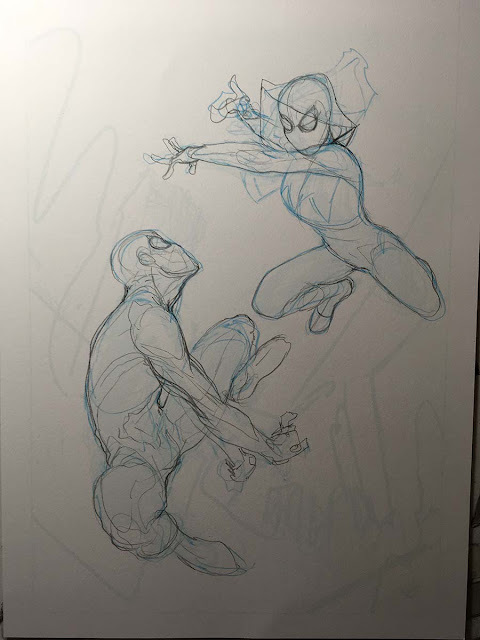 Nailing down Spidey's exact positioning. 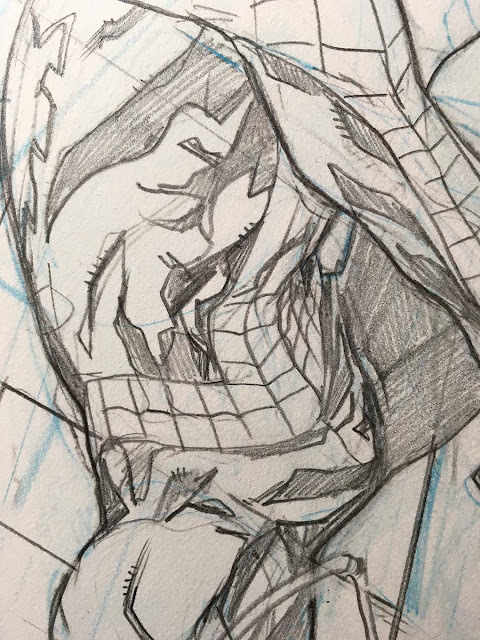 He's such a "flexible" character that you can really put him into almost any position. Smartest thing to do at this point is go back to my initial sketch and try to mimic that. 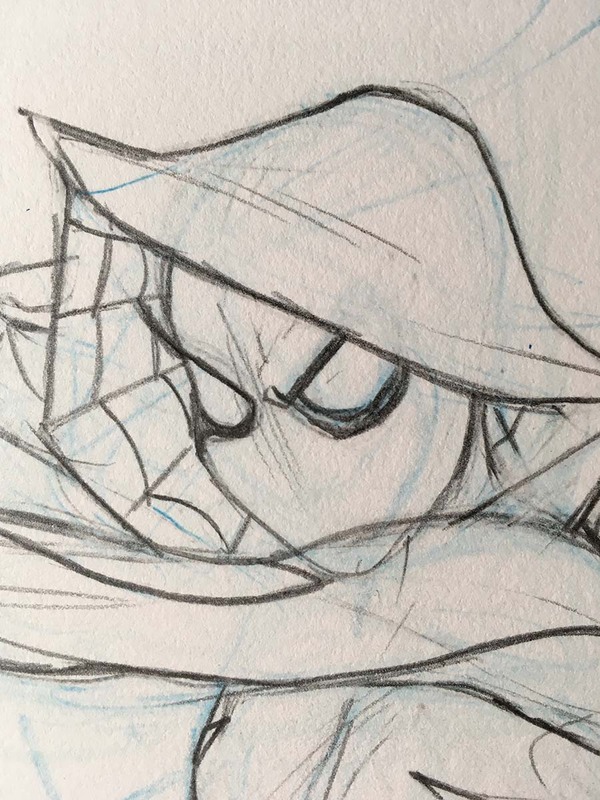 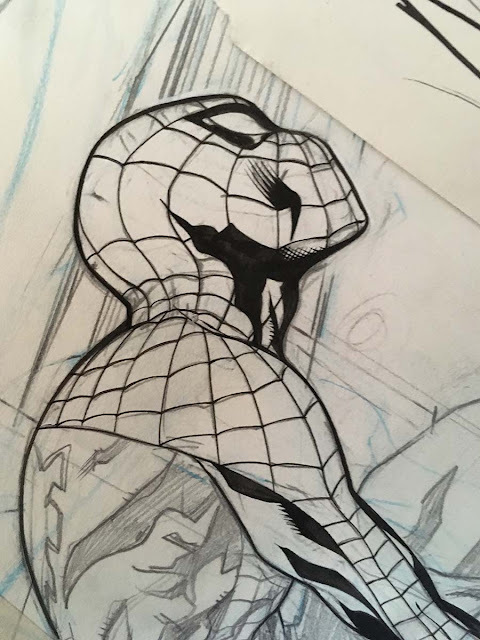 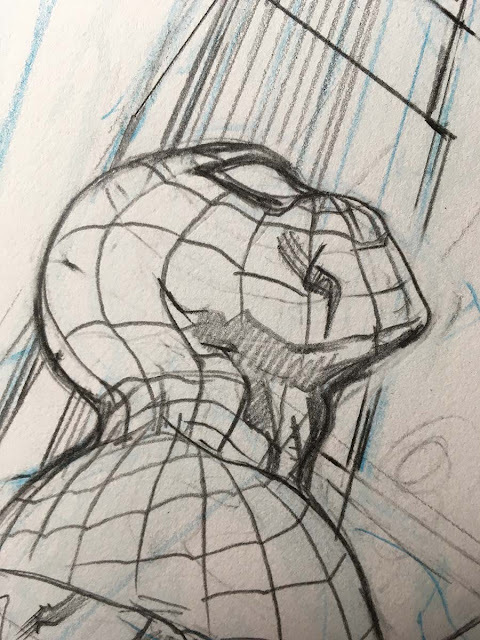 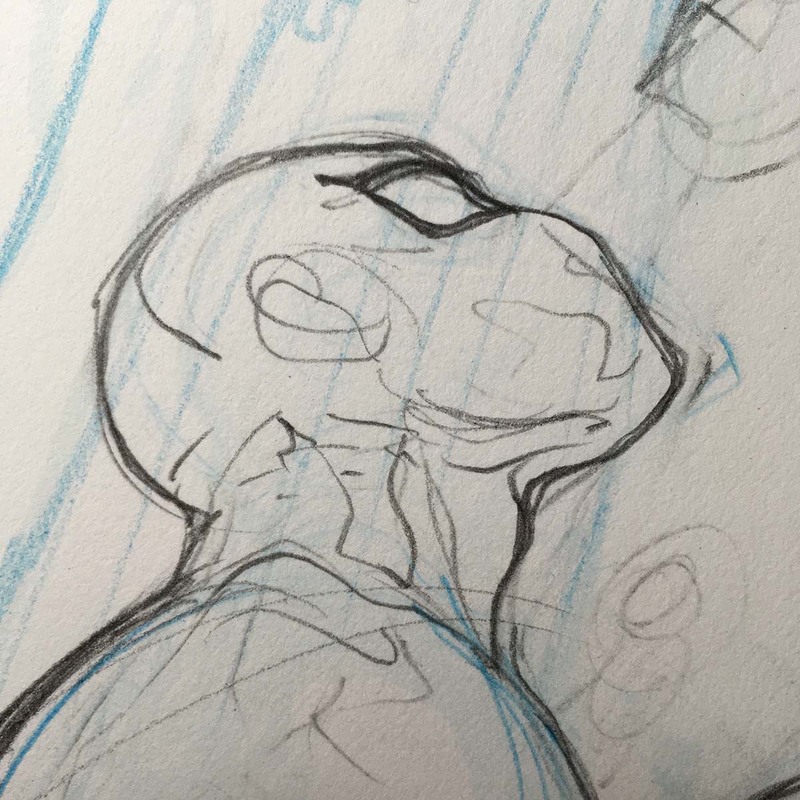 Love drawing Spidey's facial anatomy! 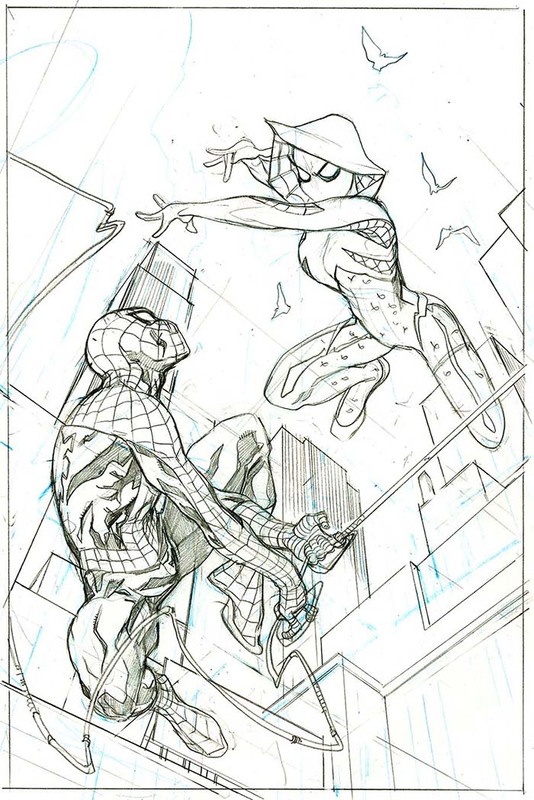 Nailing down the 3 Point Perspective Grid here for New York City. 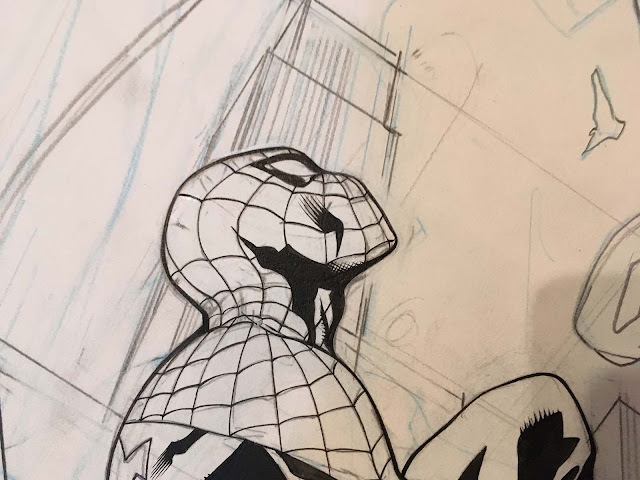 Further finishes on the parts of Spidey I'm happy with. 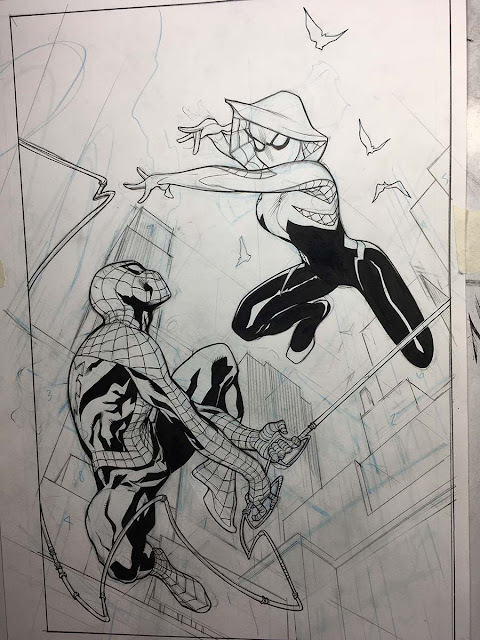 Just about done - finishing up background. 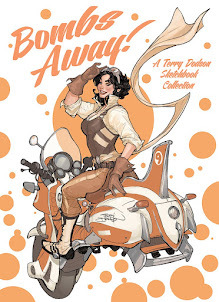 New arrivals from Stuart Ng Books!